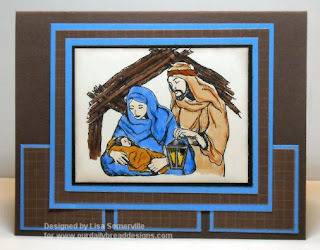 Sketch Challenge 202 worked out great for my Joy to the World image from Our Daily Bread Designs. Here I stamped my image on watercolor paper, colored using the Pencil over Marker Technique, then went back and painted over my coloring with my Shimmerz - who doesn't love Holiday Cards with a little bling!. I just love the color combo - Chocolate Chip, Vanilla and Ballet Blue. The designer paper is from the Chocolate Chip Patterns DSP. I can't really see the Shimmerz...sad face..but the card is cool. Great colors, for sure! What a beautiful card!! Love the image!